Mexican food is a favorite in our household. We can’t get enough of the flavors of guacamole, enchilada sauce, and fresh salsa. Over the weekend I took our obsession a step further and made Mexican burgers with a twist. I stuffed them with Mexican cheese! When we bit into the burger a delicious melty bubble of cheese was in the center, and it was so delicious. It was kind of like an inside out cheeseburger. To finish up the Mexican cheese stuffed burgers, I topped them with a little salsa. These made the perfect cheesy bites to satisfy our Mexican cravings on a balmy spring evening. Step 1: Add the beef, salt and pepper, and enchilada sauce to a bowl and use your hands to combine all of the ingredients. Form 6 hamburger patties that are about 1 inch thick and 3 inches wide. Step 2: Form a well in the center of each patty and add equal amounts of cheese to each well. Use your fingers to pinch the edges. 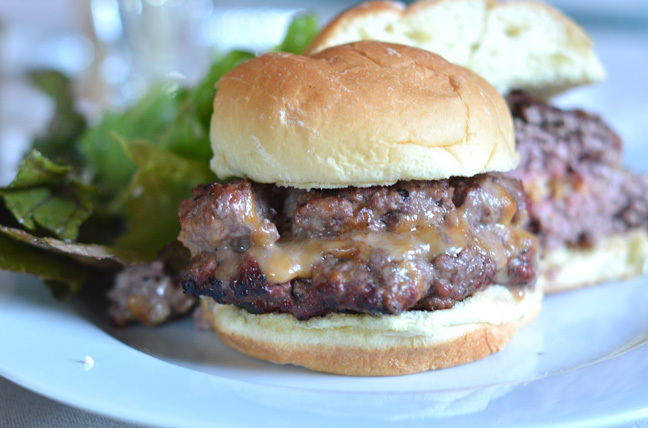 The cheese will still ooze out of the burgers a little bit but that's okay! Step 3: Light a grill to medium flame and grill the burgers to desired doneness. Place them on the hamburger buns, top with guacamole and salsa, if desired, and serve hot.